My brother in law is a lazer cutter so I am going to try and make something like this for my macro flash the MT24-EX will this be enough? to get the flashes wider? and at odd angles? 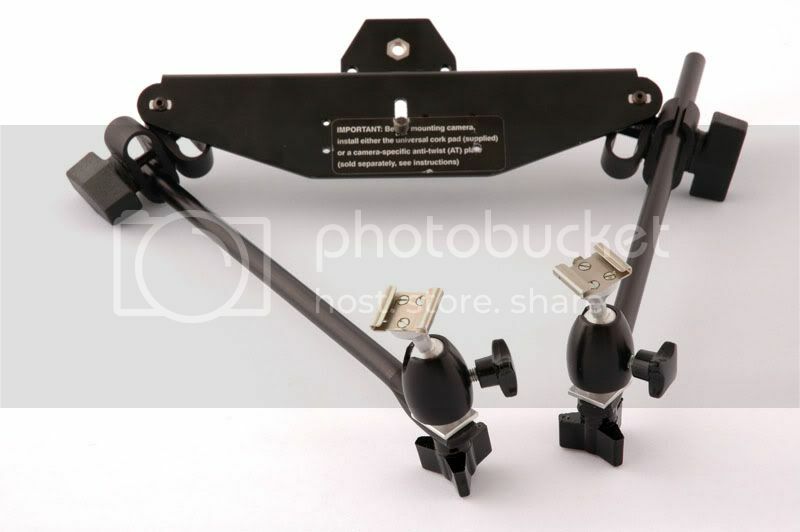 Something like this would probably work with the MT24-EX flashes. My only concern would be...How do you light a vertical composition? If you don't have a lens with a rotating tripod collar then the whole rig would have to be turned vertical. That places your flashes above and below your subject. That wouldn't look too natural to me. The way the MT24-EX mounts to the lens allows the camera to be turned vertical and the flashes left in place horizontally. If you need more separation between the flash heads wouldn't it be easier to have someone machine little extension blocks to go between the flash head and the flash mount of the current set up? If you can machine extension blocks for the unit surely you could mount arms on these blocks and get the advantage of the flash arms shown whilst retaining the MT24-EX's ability to rotate the camera in its mount. As long as you can bolt the bits on without modifying the MT24-EX itself you ought to be able to put extension arms on it. A hybrid between the flash arm set up shown and the MT24-EX?